A girl from the forest arrives in a bustling kingdom with no name and no idea why she is there, only to find herself at the centre of a world at war. She enlists at Pennyroyal Academy, where princesses and knights are trained to battle the two great menaces of the day: witches and dragons. There, given the name "Evie," she must endure a harsh training regimen under the steel glare of her Fairy Drill sergeant, while also navigating an entirely new world of friends and enemies. As Evie learns what it truly means to be a princess, she realizes surprising things about herself and her family, about human compassion and inhuman cruelty. And with the witch forces moving nearer, she discovers that the war between princesses and witches is much more personal than she could ever have imagined. Set in Grimm's fairy-tale world, M.A. 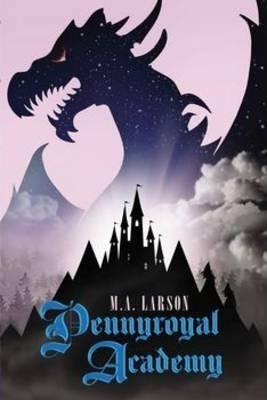 Larson's Pennyroyal Academy masterfully combines adventure, humour, and magical mischief. M.A. Larson is a film and television writer who lives with his wife, daughters, and two dogs in a canyon in California. Larson has written for Cartoon Network, Disney Channel, Disney XD, Disney UK, Discovery Kids Channel, The Hub, and Nickelodeon. As a writer on the cult sensation My Little Pony: Friendship is Magic, he has been a guest at "brony" fan conventions from Paris, France to Dallas, Texas. This is his first novel. Larson can be found on twitter at @M_A_Larson, where he frequently tweets about classic films and magical candy-colored ponies.